With the FBI still in its infancy in the first decade of the 20th century, the only American law enforcement agency with enough savvy and muscle to take down organized crime was the United States Postal Inspection Service. Letters, goods, cash, and gold made its way through the Post Office system, and any crime committed through U.S. mail, anywhere in the world, fell under the jurisdiction of the Post Office Inspectors. Frank Oldfield was the 156th Post Office Inspector, and he was on a mission to uncover and capture a sophisticated and deadly organized crime syndicate preying on immigrants in America's Industrial Heartland. Inspector Oldfield's story is told by his great grandson, William Oldfield, in the new book, Inspector Oldfield and the Black Hand Society: America's Original Gangsters and the U,S. Postal Detective that Brought Them to Justice. For the first four decades of his life, William's family told him never to mention his great grandfather's exploits, as they feared retaliation from the descendants of the criminals who remained prominent members of communities near the Oldfield family in Ohio. William did get one very valuable thing, a vast archive of Frank's criminal cases. From the Oldfield family's private collection, this book has 51 black and white photos, newspaper articles, and letters from the Black Hand and their victims that were hidden for over 100 years. In the early 1900s, Sicilian-American organized crime rings went by the moniker "The Black Hand," and the mafia preyed on Italian immigrants from Ohio to New York to New Orleans. Immigrant families who were victims of murder, dynamite explosions, and kidnappings for ransom almost never went to the police for help. That all changed in 1909 when Inspector Oldfield received a tip from a wealthy Italian victim of the Black Hand. Oldfield has built a reputation for busting criminals and using unconventional and unsanctioned methods to do so. He captured train robbers and exposed embezzlers in Ohio, New York, Pennsylvania, and Tennesse, but this was the first time he would be investigating the mafia. Inspector Oldfield's first case in the Italian community was in 1908 when Ohio police invited him to investigate the murder of a fruit seller in the town of Bellefontaine. The victim was found with two letters signed La Mano Nera, or The Black Hand. "The Bellefontaine Police brought the letters in a secure pouch to the U.S. Post Office In Columbus," writes Oldfield. "The enormous four-story federal building on Third and State Streets was the closest post office to Bellefontaine where a Post Office inspector was domiciled. There they found Inspector no. 156, Frank Oldfiled, a diminutive man in a well-fitting suit, chomping away on a cigar. Oldfield pushed some papers and files aside and opened the letters. He made a quick visual scan of the documents with his magnifying glass. A satisfied smile appeared on his face. "Since arriving in Columbus in 1901, the forty-one-year-old Oldfield had become one of the most aggressive and successful Post Office inspectors in the service. He'd run down safecrackers, exposed a corruption ring between a U.S. congressman and the New York City assistant district attorney, and busted crooks on the railroads for robbing the mail. But there was nothing Oldfield wanted more than to 'run the earth' what he believed was an international organized crime ring spanning America all the way to Palermo, Sicily: truly bad guys whose members called themselves the Black Hand Society. "Few people know that U.S. Post Office inspectors were the country's most powerful federal law enforcers at the time. Long before the FBI came into being, U.S. Post Office inspectors had jurisdiction all over the world. The presidentially appointed position gave a Post Office inspector authority to take over an investigation from any law enforcement agency in the country if the United States mails were used in an fashion. He could bust a crime ring anywhere on earth if one of the suspects so much as licked a U.S. postage stamp and sent a letter or package through the mail." Inspector Oldfield's investigation into the Black Hand's intricate web stretched across the Midwest all the way to the Atlantic. 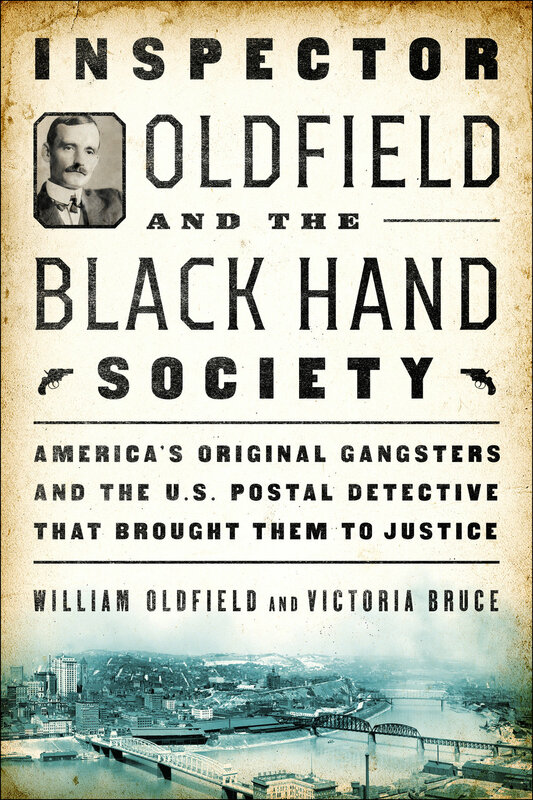 After death threats and setbacks, Inspector Oldfield was able to convince brave victims to testify in court, leading to the federal conviction and incarceration of 11 members of the Black Hand Society in the first national organized crime trial in the U.S. 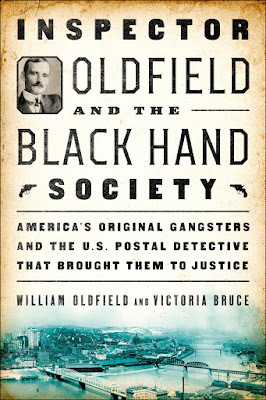 Inspector Oldfield and the Black Hand Society is one of the most thrilling books you will read this year, as this shines a light on part of America's crime history that has been forgotten.